Demonstration and testing of a check valve. Demonstration and testing of a expansion vessel. Examples of fastenings for equipment and pipes. Testin of the rate of bending of pipes. Measurement of the hardness of water and the lowering of hardness of water. 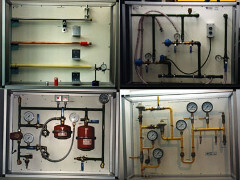 Testing of an installation for gas leaks. This model demonstrates that water can not be compressed.